The University of Northampton’s Sports Hub is part of the wider £330m new Waterside Campus which will open in September 2018. The Sports Hub was an integral part of the overall masterplan, designed by MCW, and was to co-locate indoor and outdoor sports facilities on campus enabling a programme of use to serve students, staff and the wider community. The brief emphasised the need for student use to be a priority and include competitive, recreational and social sport plus a greater focus on fitness, physical activity and wellbeing for all. The facility is to be used for academic activity with sport and teacher education programmes in particular being seen as key users. In addition, University staff and the wider community are able to take advantage of the facilities and services. 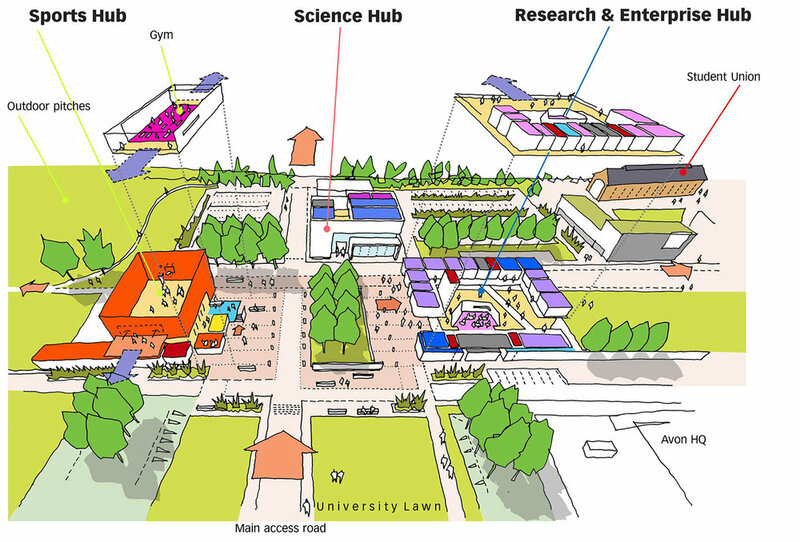 The Hub is multi-purpose in nature and designed to host both University and community events. Designed to Sports England Standard, the main building design provides a 4-badminton court sized multi-purpose hall space with associated changing facilities and storage space as the principal ground floor space. The changing facilities are designed for both indoor and outdoor activities. The first floor accommodates teaching and research space for sports science as well as a dance/aerobic studio that can also act as a small function room in conjunction with the main hall when in non- sports mode. There is a gallery space overlooking the main hall – which also acts as access to the bleacher seating when in use. At second floor level is a flexible gym space designed to accommodate freestanding cardio/vascular exercise machines – along with a two small consultation rooms. The building supports a range of external facilities including 2 Multi-Use Games areas and a full size artificial grass pitch. The design has been carefully considered to avoid the ‘black box’ shed like appearance typical of this typology and clearly defined apertures have been carefully placed to enable framed views out at strategic points towards the north, south and west. Enabling views into the building was considered as equally important reinforcing a sense of activity and passive security within the campus.